This confession is the 4th part in of the five volumes, from the excerpt testimony of brother Augusto Quiala Maquengo, a former servant and dedicated son of the Lucifer. To fully benefit from it, you need to read the remaining other 5th parts in numerical order. It was a Friday, I was coming from work at 6pm. throughout the day, and I had been thinking and reflecting on the Lord. The previous day, I had a serious revelation that gave me the impression that something mysterious was going to happen to me. So, when I arrived home by 6:30 pm, I told my wife that I wanted to lay down and listen to the News from the Living room under the mosquito net. It was the first time I had had an “out-of-the-body experience. Just as I started listening to the News, an angel appeared in the room and in that vision he told me to stand up and that we needed to go. The Angel in charge of me came to my room at 7pm while I was lying down and listening to the News after a hectic day at work. The angel asked me to rise up and let us go. I was under the mosquito net as there were many mosquitoes in that time in Angola. He picked me up from the bed and took me to the church hall where he started giving me instructions and training me on how I would meet a figure in the spirit world without yet mentioning the name. As mentioned before, my family had made a covenant with the Dragon and Leviathan (the devil himself) and sold our lives to him, even as many slaves to America and Europe. So for the Lord to break that huge covenant, I needed to face Lucifer himself in the second heavens. I got up and to my amazement, I could not touch my body, I tried talking to my wife but it seemed unfruitful. READ ALSO: Ways Which People Enter Into Evil Blood Covenant. I tried to motion and wave my hand to her, but it seemed difficult. I and the angel went a long distance up to the church hall and at that moment I did not have any clothes on me but the angel guaranteed that I would wear my proper clothes once we were in the church premises. I thought we would not find anybody in the church but to my surprise there were many people singing and worshiping God. What was amazing was that there was fire over their heads; they were under the anointing of the Holy Spirit. There were also intercessors praying for the general overseer of the Church. The Angel took me immediately inside a church room and dressed me up and put me in the center of the church while everybody was looking at me. And from the expression on their faces, I had the feeling that I had a difficult mission ahead of me to accomplish. The Angel told me who I was going to meet and how he was. He then trained me, teaching me how I should behave when I meet this personality and what I should do!! After the training, the Angel held my left hand and we went right up to the second heavens where we landed on a temple that was so weird, it was clean but had a pentagram and a circle around the pentagram star. The temple had four white stones on each corner and when I saw that I knew within me that I was going to meet somebody weird and evil. The temple was full of evil and there were giant demons chained as guards around the temple pillars. The angel went and sat on a tree outside the temple in the second heavens and started looking at me with his legs and hands crossed like somebody seating down comfortably. I started looking around to see the person that the angel who had described to me at the church premises. While I was turning around this evil temple the angel seated at the tree signaled to me to look behind and when I did, Lo and behold, a young, beautiful, charming, attractive personality full of seduction was behind me. READ ALSO: Who Is Your Number One Household Enemy. 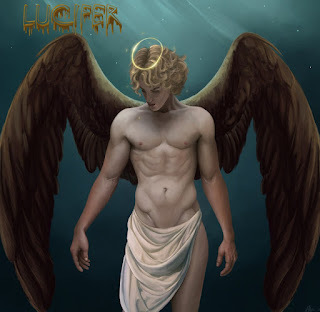 Brethren, Lucifer is not who we think he is. He was so attractive that the apples of his eyes were pulling me towards him as if I was going to enter inside him. His power was so big that I could barely stand on my feet. When I faced him, I looked into his eyes as the angel had instructed me, his eyes looked crystal clear around but too evil black at the center, and I felt as if it was pulling me from the floor to swallow me up. His eyes depicted evil and I felt I was in danger of dying. I had to stand firmly grounded to the floor to avoid being extracted by these evil eyes from the floor into that evil world which the center of his black evil eyes depicted. The angel at the training had told me to always keep my eyes fixed on him and to never allow my eyes to deviate whilst looking at him and that I had to look into his eyes and not fear. So I started looking into his very eyes while both of us were moving around the temple with each one’s eyes concentrated on the other. I did not know then why this scenario of eye to eye search was taking place and what it meant. The angel sitting in the tree spoke to my mind as if he had read my mind and knew what I was thinking, saying: because it is written, “The eye is the lamp of the body. 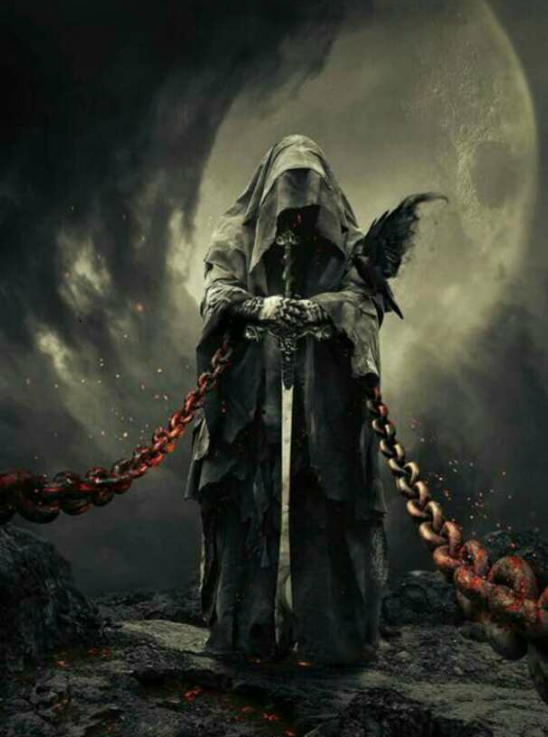 If your eyes are good, your whole body will be full of light, but if thine eye is evil, your whole body shall be full of darkness and how great is that darkness! (Matthew 6:22-23)” and this is why the devil is looking into your eyes to find a fault in you. Immediately I heard that in my spirit, I got a Holy anger and started concentrating on looking very intently into the devil’s eye and within me confessing Christ. Then the devil started misquoting the word of God by twisting some verses, and I started contradicting Him saying,: no, it is not written like that and he would say; it is written, I would say, No it is not written like that, all this while, I was not mentioning at the end of my declarations, the name of Jesus Christ, when at the last misquote of the devil I angrily said: NO, it is not written like that in the name of Jesus Christ. Immediately, the whole temple ground trembled as in an earthquake and the giants fell down and the devil was thrown down on what looked like concrete floor. 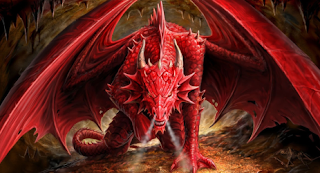 He started shaking there where he changed into an evil beast and with a shout and smoke disappeared. As I write the account of what transpired that day, it is as vivid now in my mind as if it happened only yesterday. After that I stayed there alone, looking for him to re-appear anytime. 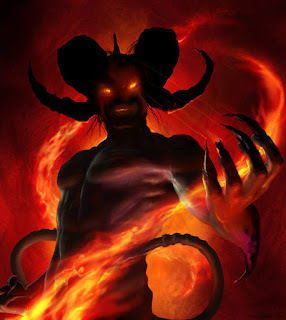 While I was looking, he re-appeared in a smoke like appearance of evil and full of wickedness this time, all his powers were loaded upon him and evil was radiating from his head and he had different kinds of wickedness. I said to myself that this time he would tear me apart and swallow me seriously. But to my amazement, I felt peace and calm come upon me I was able to concentrate and I started fighting him fist-to-fist. I would strike him on the head and he would strike me back without success. While I was in this state, I physically woke up to urinate, but even at that level, I tried touching my wife to speak to her, but was unable to. 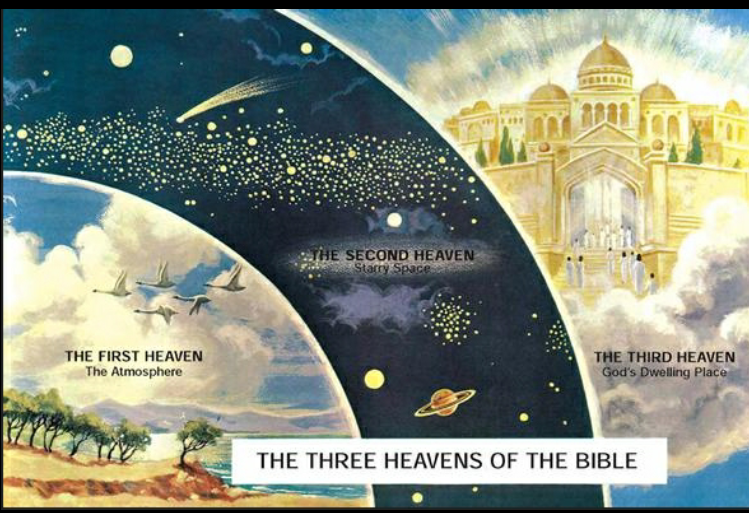 Each time I would visit the gent’s and almost immediately, I would return to the second heavens with the speed of light. This happened about three times. I hardly noticed the transition between getting up to pass water and the moment of fight in the second heavens. I immediately looked at the angel who was seated comfortably on the tree, thinking that he would come and help me but he remained where he was seated. I thought to myself, why is this angel not coming to help me out? And he read my mind again and replied: This battle must be fought by you ALONE. READ ALSO: Exposing The Strategies Of The Enemy (Placebo) By Howard Pittman. Then I and Lucifer continued fighting and fighting when the angel signaled to me that there was a stick like a baseball bat on the floor, then I picked it up and struck the devil on his forehead and it got swollen; he developed a very long bump with blood at the end of it which was not dripping or falling. Then at that very moment when he fell down, the giants around the temple were released from their chains to come and help the devil fight me. I started fighting all of them at once. They started launching themselves unto me like a swarm of evil bees covering me. Then I seriously beat them up in the name of Jesus and defeated them all. At this time, they all transformed themselves into evil beings and vanished. 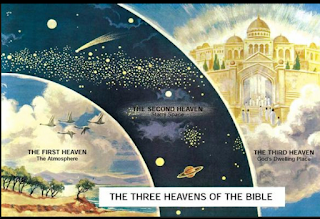 When this fight ended, the angel came down from the tree and held me up and said: we will now go backwards facing this temple as we came and right back into the church again. When we reached the church floor on earth, I and the angel looked together up at that second heavens; the heavens was open and Lucifer appeared in the clouds to tell me: I will destroy you, and the angel told me: tell him that if he did not defeat you in the fight, he will never defeat you again. So I told him that and he vanished and the heavens closed. Then immediately the angel took me back to the house to meet my body lying on the bed. When I came to myself, I started telling the incident to my wife, as my left hand was a bit paralyzed. I called my God-father for prayer and my hand came back to normal. After this incident, my life became miserable and I was attacked from all sides. Immediately the next day after the fight, the devil sent an evil angel to meet my family in the day time and they had an emergency meeting where they were deciding my fate at the family level. While the family was meeting against me, my brother got out of the meeting and told me that he did not want to be part of the family plot against me and told me everything they were planning. READ ALSO: How To Stop Household Wicked Enemies-Operation No Mercy. Every time I would go to work, I could sense and even see some evil people walking with me and inside the tax I would take. I was so aware of their evil presence with my physical senses. I had a 3000 banana plantation but it dried up mysteriously. I had money in my bank account, incredibly, that money was also confiscated by the police. I had bought a kombi car which was mysteriously destroyed on the way from South Africa. In a bid to have something to do while without a job, I bought a bus for business, but that too got lost mysteriously and I cannot explain how. One day, I was driving with my wife and children in a borrowed car of a brother in Christ, and the car started running at top speed, guided by a demon. We were heading for an accident until the Lord miraculously saved us. When people came around us they discovered that we were all safe with every one unharmed. My life became a disaster like Job in the Bible, though I did not lose anyone to death. After all these trials, a family member was sent with the mission to come and bewitch my children and kill one. When this sister arrived my house and got hold of my son, Ezequiel, the boy immediately started convulsing and dying. His eyes popped out and he started foaming profusely at the mouth. I did every kind of prayer and applied every kind of warfare technique using bible verses, but it seemed unfruitful, because the boy was dying. I was finally inspired to run to my God-mother’s house that is about 20 or 30 kms from where I lived. When I arrived, my God-mother took the boy and lay over him inside the room in Elijah-like prayer over the Sunamite woman’s son and my boy got up miraculously. In addition to that, my children started being attacked with sickness and diseases. To my utter amazement and disbelief my family came physically to beat me and my wife up, because we had destroyed the family covenant and altars. After this incident, we made the family members understand that Christ alone should be worshipped and adored. No family alters should be revered. We forgave them and restored them to Christ. READ ALSO: The Danger Of Unbroken Curse In Life Of A Christian. I started receiving lots of demonic visitations in the bedroom and living room that it got to a point I fought with my physical hands and defeated them in the Mighty name of Jesus Christ. It would always happen that after several fights my body would get paralyzed on the right side and I would call my spiritual father (mentor) who always prayed with me and Jesus Christ would make me whole again. I remember one day, I was watching TBN and a servant of God was preaching with such a powerful anointing about victory over demons, when all of a sudden, six giant demons appeared in my living room and I started fighting with them literally. When my wife heard me, she came to join in the fight without seeing these giants in the room, but I was them clearly and could even feel their grip over me. What she did was help by praying against them. It was such a moment of torment and fight which I thought would never end. I lost the job I had mysteriously and I was baffled. I immediately entered into a 21 day fasting programme that the ministry had planned for disciples. During the fasting God did many things and wonders. I lost almost everything I had. I had fought so many pythons who were appearing on my visions even when I was at the Hospital bed sick; the nurse was sent by demons to inject the wrong medicines into the drip when immediately the Lord made me to wake up and I noticed that my body was allergic to the drugs being administered and I was beginning to swell in the arm, so I called out the doctor who noticed that a wrong prescription which belonged to another patient had been administered to me. READ ALSO: My Encounter With Demonic Attacks By Jonathan Ezeke. Right after this incident which was at about 11 am, I feel asleep and I saw a python come to the hospital bed, I took a sword which came from no-where and sliced the head of the python and killed it. When I woke up, the room mate who was on a serious coma status got healed and started walking miraculously. Glory to the Lord Jesus Christ! After all the troubles, I went through, the Lord started restoring me. The Lord restored my spiritual being as a human being and poured His glory upon me. The Lord baptized me with His Holy Spirit and several gifts started manifesting through me until now. The Lord provided a job while in the fasting of 21 days, healed me and my children. Brethren, our God is awesome and very powerfully. He exists for us and He is a really Father who defends His children fiercely. I speak only by His grace and power. Brethren, this experience has gotten me very aware of the powers of wickedness and the kingdom of darkness, but most assuredly about the Mighty and awesome deliverance of our Lord Jesus Christ. This is the first time I am writing this experience of mine to be distributed to everyone, to build up your faith in the Lord and to assure you of the victory we have in Christ Jesus our Lord and Master. I normally talk about it in bits and pieces, but has never written it down in its entirety for anyone to read till now. 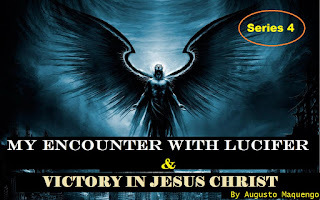 Recently, Lucifer appeared in my bedroom to shout at me and ask me why am I sharing my testimony. 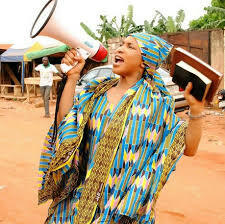 Brethren, it is absolutely a divine instruction to share my testimony with everyone. The Lord knows that it will deliver many and encourage many to know that the devil is a defeated foe even with all his powers. 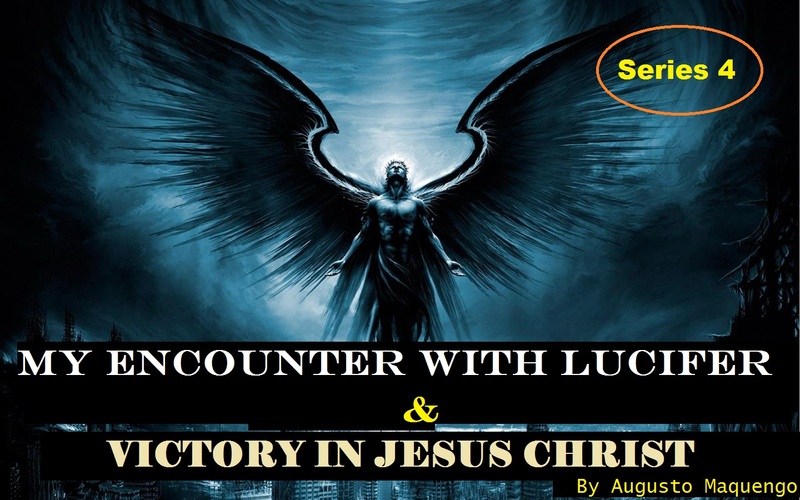 To Continue In Last Volume; The Coming Of Our Lord Jesus Christ – Visions Of The Rapture"
2 Responses to "My Encounter With Lucifer And Victory In Jesus By Augusto Maquengo — Series 4"
Very informing. Thank you for the testimony. A blessing to all the earth. Praise be to Christ!